Last week I finally got my fleeces boxed up and sent off to Michigan. It was an all day affair. First I had to get the fleeces packed into bags. Then I had to cram them into a box. However, I couldn’t find a box large enough for all three. Since I wanted to ship via UPS, I went to a mailing store intending to get a bigger box. They had one on hand and helped me get everything ready to go. It’s out of my hands now! Rosita’s fleeces took the most work. I started by laying out a sheet in the living room upon which to spread them out. Next I went through the fiber to make sure I hadn’t left any pieces of paper behind, otherwise I would end up with confetti in my roving! 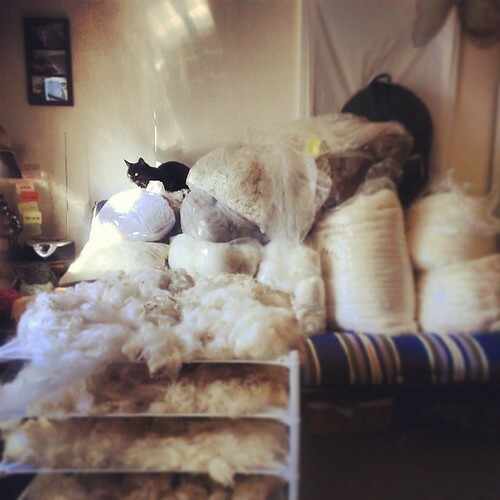 In January Zeilinger Wool Company usually has a sale on fleece processing. This year you can get a 20% discount when you prepay. That may not seem like much, but every little bit helps, especially if you are shipping your fleeces to them. Every other time I have used their services, I’ve dropped my fiber off at their booth during a fiber festival. 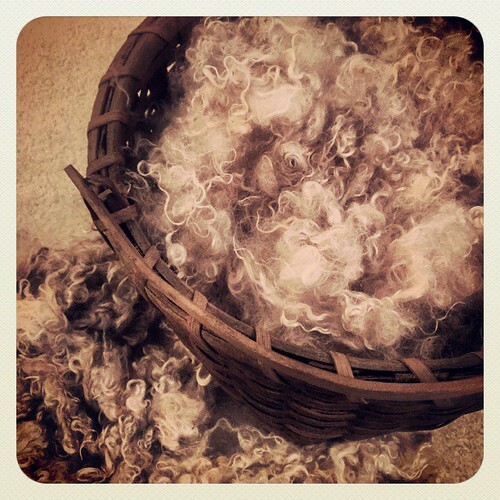 They weigh it, I pay, and then in a few months I get a box overflowing with beautiful, clean roving. However, I may not have the chance to see them this year if I don’t get to Maryland Sheep & Wool. And since I have a few fleeces that I’d like to be processed, I thought I’d take advantage of their sale. The first step was to set out all of my fleeces and take an inventory. I had already done this in October, so I had a fairly good idea of what was in my stash. Slightly less than what is pictured below, since I washed and dyed at least one for the fall season. At that time, I pulled out Rosita’s fleece from 2012 to get it in the bath. I selected it more because of its age rather having a specific purpose in mind for it. I really hate to have a dirty fleece sitting around for too long. The grease can stiffen, plus it attracts unwanted attention from predators. After the fleece was clean, I set it aside until I could decide what I wanted to do with it. 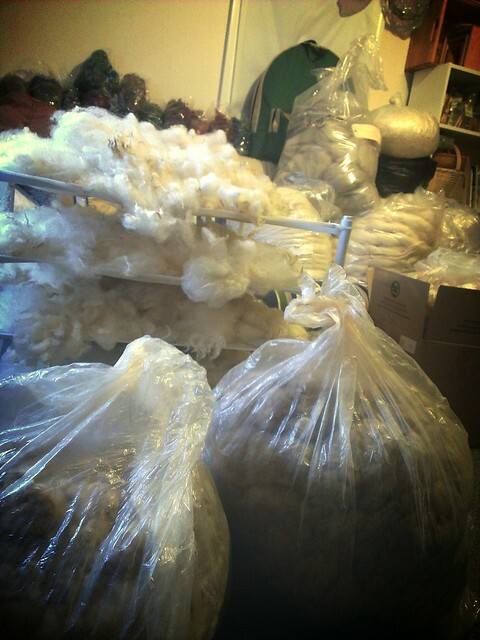 With fiber processing on my mind, I pulled out all the fleeces again, this time taking note of their weights. Zeilinger’s has weight requirements for raw and washed fiber, otherwise the price per pound goes up. Minimum weight for raw is 7 lbs and 5 lbs for washed. 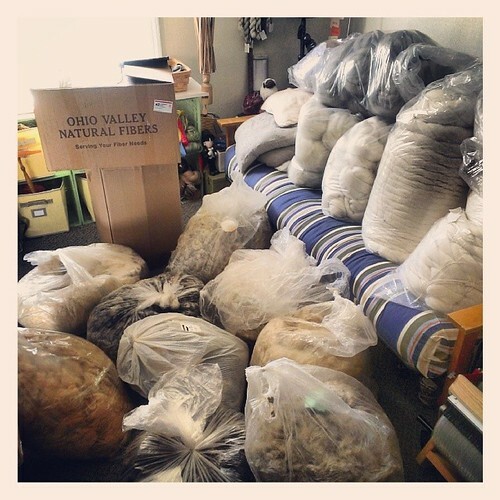 I was feeling a bit discouraged, since many of the fleeces (raw) were 7 lbs or less. I knew by the time I washed them they would be far below the minimum and I’d have to pay $14/lb. Even though I had many fleeces to choose from, I didn’t want to combine different sheep. Then I realized I had two years of fleeces from Rosita. AND one was already clean! So I got 2013 Rosita into the washer last week. Now she’s all clean and ready to go. By combining those two, I should have no problem exceeding the 5 lb minimum. Today I went back to the Zwool website and I reread their instructions. That’s when I noticed that only raw fiber had to be over 7 lbs. I have two more raw fleeces that are 8.6 and 7.6 lbs, so I think I will have them processed too. It costs $1 more per pound to have the mill wash for you. It saves me time and resources, and since I only have until the end of January to get the discount, I will hand that job off to them. In all, I plan to send four fleeces out for processing. In return I will have three bags of roving. One from Rosita (two years worth), one from Tootsie, and one from Molly. I did get Tootsie’s fleece processed last year too and it came back beautiful. It’s such a lovely color that I am hesitant to dye it. These are all from the same farm in New York. I’ve been getting fleeces from her since 2011 when I first bought Rosita at the New York Sheep & Wool Festival. They are a Border Leicester/Corriedale cross. 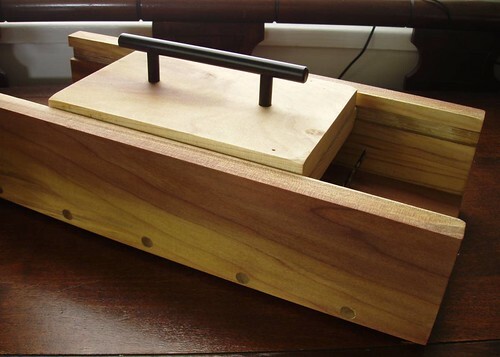 Last summer Rich and I used the plans from Minnetonka Works to make a box picker (original post & photos). In the end it was a beautiful piece, but didn’t do much to help speed up my fiber processing. It seemed that the teeth overlapped too much, or the locks I was attempting to pick were too long. They would just wrap around the teeth and then nothing would move. Disappointed, but not ready to throw it on the fire, I found a home for the picker somewhere in the mess that is my wool room. I figured I would find a purpose for it eventually. And after more than a year, I finally did! In the midst of an extensive custom project, I discovered that it will work with mohair. Hooray! Believe me, hooray. I was facing hand-picking four bags of mohair locks, but decided on a whim to try out the picker. I was thrilled to find that it was functioning (seriously, who wants to spend that much time making something and then it doesn’t work??). These are extremely clean locks, so there isn’t a drop of grease to make them sticky. They are shorter than the wool locks I have tried. They aren’t has dense, thick, wide (?). Not sure how to explain that. Basically they were a bit matted and needed to be fluffed for spinning. Can you see the difference in the photo below? The locks in the basket have been picked, but those in the corner have not. They have retained the curl, but were just opened up a little.